It seems that M. Night Shyamalan has something of a golden touch, with a string of three entertaining films that present mainstream Hollywood cinema within a framework of weirdly unnatural, yet immediately identifiable worlds, whether it be broaching the subject of the supernatural (The Sixth Sense), invincibility (Unbreakable), and lastly, the threat of alien invasion (Signs). Shyamalan's approach of taking the ordinary and familiar and making it dangerous and threatening is nothing new, but his careful execution reveals a cuddly and comfortable world of normalcy bulging with hints of whispered weirdness. With Signs, Shyamalan once again wears the dual hat of writer/director, and his story builds quietly, with events unfolding with deceptive quickness, yet at the same time with an intentional and deliberate slowness that he uses to give his plot and characters a recognizable place in a grounded reality. Then, things get creepy. When former minister and recently widowed Graham Hess (Mel Gibson) discovers crop circles in the cornfields of his rural Pennsylvania farm, worldwide situations begin to occur that cause him to question not only the reasons he lost his faith, but whether or not anything is truly out there. Graham's two young children, Bo (Abigail Breslin) and Morgan (Rory Culkin) soon begin believing that aliens are coming, and take to wearing tin foil hats to prevent their minds from being read, or so they claim. Merrill (Joaquin Phoenix) is Graham's headstrong younger brother, and all four characters are forced to travel down a figurative road where the fate of each may be delicately intertwined, and matters of faith are put to the test. Shyamalan cites The Birds, Night of the Living Dead and The Invasion of the Body Snatchers as the cinematic influences for Signs, but there are also noticeable parallels to Jaws. Spielberg kept the shark hidden for much of that film, and what scared us wasn't what we saw, but rather what we didn't see. The surfacing yellow barrels that hunted Quint's dilapidated boat are, in Signs, replaced by flickering lights on a baby monitor or a rustling in the cornfield. When the shark finally jumped aboard the Orca and started munching on Quint, it was almost an anti-climax, and the same thing nearly happens in Signs. Shyamalan, however, has kept a tighter rein, allowing things to remain mysterious and by doing so manages to uphold a level of tension far longer. Bear in mind that Signs is far removed from the typical Independence Day-style of alien invasion films, and as such may have left some viewers a bit puzzled as to the director's intent. Shyamalan straddles the fence by offering more thrills than outright scares, opting instead to keep the potentially frightening things in shadows, than allowing for an actual all-out special effects bonanza. It's a UFO/crop circles mystery that is more concerned with the interactions of its human characters than dazzling us with outrageous visuals. Shyamalan borrows from the Hitchcock school by telling us (or at times simply implying) what's out there rather than showing us, and when his version of Spielberg's shark jumps out of the water it could not nearly match what had been bouncing around in my mind. That's not to say I didn't enjoy this film; on the contrary, I enjoyed it immensely. Shyamalan's storytelling here is at its subdued best here, and while The Sixth Sense, and to a lesser degree Unbreakable relied on jaw-dropping revelations, Signs takes an unexpectedly softer approach to what a blockbuster's climax should contain, and it is certainly worth the journey. Image Transfer Review: Signs is presented in a THX certified 1.85:1 anamorphic widescreen transfer, and is a noticeably dark film. Much of the dramatic action takes place in shadow or at night, and a lot of pivotal plot reveals have been filmed in low light. There is a fair amount of grain, and image detail is not as sharp as one might expect from such a recent release. That's not to say this is an inherently flawed transfer, but it is just not as crisp as I had hoped. The most significant flaw is the presence of edge enhancement, which is particularly apparent and somewhat distracting on a number of key scenes. I was a little underwhelmed with the image transfer, as I was expecting a sharper, more defined image as it is part of the highly touted Vista Series. Audio Transfer Review: The primary 5.1 Dolby Digital EX track has a number of extremely well-defined moments where things like slamming doors, barking dogs and the patter of unknown feet swirl around ominously, and build on the level of tension and suspense that Shyamalan works carefully to create here. This isn't an overly aggressive track, and the surround cues are not overdone or excessive, and as a result their presence is effective and downright creepy. Dialogue, for the most part, is mixed cleanly, though some of the mumbly one-liners from Culkin and Breslin had me reaching for the rewind AND the subtitle buttons on my remote. As expected, the James Newton Howard score resonates loudly, though it is used rather infrequently, an intentional decision that Shyamalan addresses in the extras section. The absence of a DTS track might offend some purists, but this 5.1 mix is a good one that enhances, as opposed to overpowers. A 5.1 French language track is also provided. Extras Review: This single-disc Vista Series title is not jam-packed with extras, though the anchor of the supplements is Making Signs (58m:54s), a multi-part documentary that is a solid feature covering most of the key elements of the film's production. 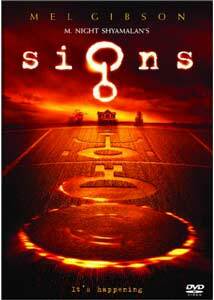 This segment consists of six separate sections: Looking For Signs (06m:11s), Building Signs (08m:02s), Making Signs: A Commentary By M. Night Shyamalan (22m:33s), The Effects of Signs (08m:31s), Last Voices: The Music of Signs (08m:20s) and Full Circle (04:48s), which can be viewed separately, or via the preferred Play All option. Though most of the principal cast and production crew get screen time, this is largely all Shyamalan, as he walks through everything from analyzing the film's meaning to set design to CGI to music. The separate segments are bite-sized enough to not be overwhelming or daunting, and the content is actually informative, rather than fluffy. The segment on the CGI creature creation was particularly fascinating, and includes some CGI test footage from ILM when the development of the design was still being formulated. Deleted Scenes features five cut sequences, totaling just over 7 minutes in runtime. None of the excised footage is especially salient, though the longest of the bunch (Aliens In The Attic and The Third Story 05:07s) is the most cohesive, and includes a great attic door moment with Phoenix and Gibson. Storyboards selects three scenes (Graham, The Knife and the Pantry, Graham and Merrill Chase, and The Unknown Trespasser) and gives viewers the opportunity to use the angle button to toggle back and forth between animated storyboards and the final version. Audio options are plentiful here, with the chance to choose and compare between the 5.1 Final Mix, the 5.1 Score Only, and the 5.1 Effects Only. I'm not a big storyboard fan, but I like watching scenes stripped of dialogue with either just score or sound cues, so I was a happy camper. Wrapping things up is a minute or so of Night's First Alien Movie, made when he was a teen, with an introduction from the director. This is a silly bit of fluff, with a Halloween masked robot chasing Shyamalan around his house. This dual-layered disc is cut into 21 chapters, and features a THX Optimizer setup section as well as optional English subtitles. A Register Your DVD option, for those of you with DVD-ROM drives, promises registration in a disc replacement program and DVD technical support (whatever that is). Borrowing slightly from a number of classic genre films, M. Night Shyamalan blends it all together into a paranoid end-of-the-world story that tackles relatable issues of faith and coincidence; and much like Jaws, Signs allows your mind to work overtime to conjure up much of the scary stuff that goes bump in the night.